Discussion in 'Fan Art' started by Arpy, Jan 25, 2019. I'm calling this variant the Velázquez, and it's what I imagined a fully-restored Curry (with era-appropriate nacelles) to look like after first seeing it on screen. I'm not as big a fan of the original. Another fan's version. And another. Ideally, I'd play with the pylons a bit and angle them a little further down and back, and may post an updated version later. What really stands out to me here is how perfect the under area is for a giant attachment that could transport a few thousand troops/colonists/refugees. We never saw troop transports in the Dominion War (ahem, Sydney Class, ahem), but if you're going to take a planet/system/sector, even with future tech, I think you're going to need maybe millions. Still I felt the saucer and stardrive were too cramped. Why not get rid of the neck and merge them à la Voyager if they’re going to be so close? So, I separated them further and like the long elegance of it — reminiscent of TOS and 2001: A Space Odyssey. I've never really liked the connection point of the linebacker-thick Excelsior neck with the blade-thin Excelsior stardrive, and the thought came to me to flip it, if only to play with and explore different configurations. I found I liked the hornet-like shape of the saucer, neck, and front stardrive. And the overall shape made me think of an Olympian on the rings. There is an aft shuttlebay where the deflector typically is and a deflector where whatever this is is. This ship is primarily a subspace research and communications analysis vessel, and, by virtue of its Excelsior parts, a highly defendable one at that. Like the Phoenix's, this AWAC is wider than it is long and (from the front) gives a slight hammerhead vibe. I'm not really happy with the AWAC's design atm, but I'm working with an unsophisticated program and need to let it go for the time being. I may shorten the front blade to keep the ship's overall left/right cantilever balance a thing. Raul, Cyfa and Atolm like this. The Tiburon reminds me a little of the Promellian battlecruiser - I think it's the AWAC stuck out at front? Like Atolm, I'd like to see more of this one, please. The justification for its design/layout - as a subspace/communications vessel - has me convinced. Would be nice to see all views not just side views of your projects. 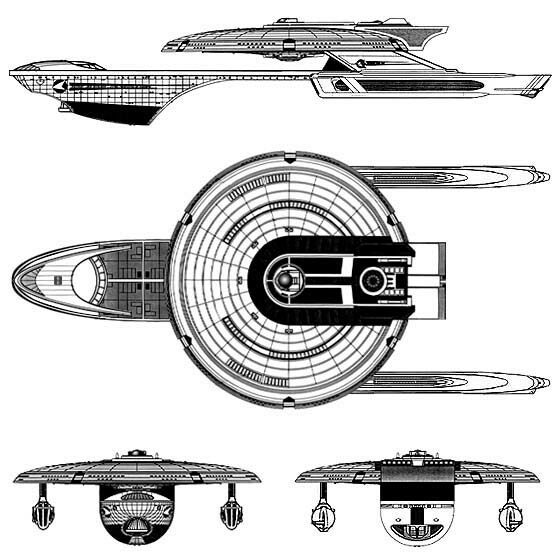 Make the excelsior hull even wider, multi-layered--something to bridge it and the larger ST ships that do resemble that design, longer nacelles and all. I don’t understand what you mean. The nacelles are standard Exelsior length. The only things longer are the neck (so it’s not as close as in the second pic in my first post) and the stardrive (so that the AWAC is far removed from the habitable parts of the ship). What are the larger ST ships that resemble the design?